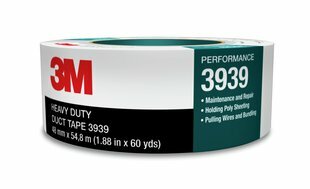 3M™ Heavy Duty Duct Tape 3939 has the high tensile and adhesion strength that is required for splicing, masking, patching, seaming, hanging poly sheeting, sealing PVC pipes, covering trip hazards, as well as many other industrial applications. Industrial-grade duct tape for splicing, patching, masking and sealing. High tensile strength tape will hold under stress. Thick rubber adhesive will bond to rough and smooth surfaces. Silver polyethylene surface resists water, wear and abrasion. Use for hanging polyethylene drapes for containment activities.